We will have cameras at the Ceremony venue at least one hour before your guests start arriving. As well as allowing us to make final preparations and shoot some external footage. The main reason for being there so early is to film your guests arriving, really capturing the build up, excitement and the atmosphere of your special day. We will film the entire Ceremony using two cameras and two camera operators. This really allows us to capture all the magic moments from different angles creating a truly cinematic result. We also use the latest wireless microphones to ensure we capture every word without being too obtrusive. Pre-Reception: This will include the guests mingling before the Wedding breakfast, entering and being welcomed by the receiving line (if applicable). We will also capture the entrance and welcome of the Bride and Groom by the guests. We then leave you to enjoy your Wedding breakfast, returning for the cutting of the cake. We will be there to capture all of the speeches, again using 2 cameras. We again use wireless microphones to record every word whilst remaining as far away as we can be. This is really important (people can be nervous enough as it is). The cameras we use are so good, we can capture close up footage from 80 feet away. Our clients tell us that most guests didn`t even know the speeches were being filmed. An absolute must in my view. A short summary of the day using creative effects to really capture the true romance of this very special occasion. Again, set to the music of your choice (perhaps your chosen first dance soundtrack) and is included on the wedding film. A truly beautiful way to end your wedding film reflecting on the special moments of your wonderful day. This is really something rather rare and very special. This is a great way to entertain your guests and be entertained by your guests during the quieter time between the ceremony and speeches. In essence, we will work with you preparing and planning the filming, during the day we will film your guests miming to a song of your choice. We then painstakingly edit the footage, overlay the original soundtrack and hay-presto you and your guests have produced your very own pop video. Its great fun to film and will be watched time and time again. We supply 20 copies for you to gift to the stars of your marryoke, this separate DVD will also include the outtakes - there are always outtakes! Your wedding will be filmed and edited in High Definition (1080i). Nearly all modern TVs (flatscreen) are capable of viewing HD footage; all you need is a Blu-ray player and you`re good to go. 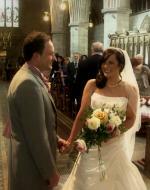 We can then provide you with a copy of your full wedding film in glorious HD. This option is available before and after your film is edited, so you can watch your wedding film in HD on the very first viewing. Treat your partner to the ultimate gadget present in keeping with the most fabulous day of your life. We purchase a brand new Apple iPad 2 at the most competetive price and set it up. We then create a copy of your video especially optimised for this tablet computer. Your entire wedding film - ready to play whenever or wherever. Why not surprise your family and friends in a way that will bring the memories of your special day flooding back time and time again. We will create your very own `Thank you DVD`, including a message from you and the highlight montage of your wedding day. Each disc is presented in a paper DVD case for easy posting. This really adds to the overall feel of the day. Clients often comment how great it was to see the preparations of their partners and the exciting build up to the big moment. We can film both the Bride & Groom preparations (subject to location), this footage will then be backed by the music of your choice (or you can leave that to us) and is used to set the scene and build to the Ceremony itself. Parts of the day you normally don`t get to see. Your wedding day just flies by... The same is true of the evening. We will capture all of those special moments. This option also includes our famous `Diary Room` (think big brother), a great way for your family and friends to leave you wonderful wishes and thoughts of the day. These messages are then included in your final Wedding Film, we are very diplomatic here, and can provide both censored and uncensored versions if you wish (if you know what I mean!!!). We promote the diary room throughout the evening through the DJ or band that you have in the main room - great fun and just fantastic to look back on over and over. If you are having fireworks, we will stay for those too. Coverage till 10-10.30pm. This option can be added to your wedding video package where you have booked us for the evening celebrations. This is particularly worthwhile if you have a number of additional guests arriving in the evening that would have missed the Ceremony. In essence, we will take footage from the day and creatively edit a short sequence backed by music of your choice. This 5-8 minute film (including slow motion, perhaps black & white scenes) will be projected onto our own GIANT SCREEN and shown to the guests just before you take to the floor for your first dance - this really does go down well and allows ALL of your guests to truly share and experience your special day - on the day. This film sequence is also then added to you final DVD. Once your wedding video is edited, we can encode the entire film (or just the Marryoke and/or Highlight Montage) for you to play on your iPhone or iPad in glorious High Definition. We will also provide you with a copy on memory stick which you can send to friends and family. The cameras we use take 24 frames per second, at an average Wedding that`s over 400,000 frames - we select the best 100-120 and load them onto a digital photo frame, you can then enjoy pictures of the day no one else will have. This option includes the latest Hi Definition 7" digital picture frame and 2 GB memory card.